Hook the clamp found in the vehicle tool kit » page 158 into the reinforced edge of the wheel trim. Push the wheel wrench through the clamp, support on the tyre and pull off the wheel trim. 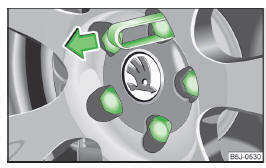 Press the wheel trim onto the wheel rim at the valve opening provided. Then press the trim into the wheel rim until its entire circumference latches correctly into position. Use the pressure of your hand only, do not strike the full wheel trim. Avoid striking the trim heavily when it is not yet inserted in the wheel rim. This could cause damage to the guide and centring elements of the trim. When using the anti-theft wheel bolt, ensure that it is in the hole in the valve area » page 161, Securing wheels against theft. If wheel trims are retrofitted it must be ensured that an adequate flow of air is assured to cool the brake system. Push the extraction pliers » page 158 sufficiently far onto the cap until the inner catches of the pliers are positioned at the collar of the cap. Remove the cover in the direction of the arrow » Fig. 137. Push the cap onto the wheel bolt up to the stop. The wheel bolt caps are housed in a plastic box in the spare wheel or in the storage space for the spare wheel. Wheels and wheel bolts are matched to each other in terms of design. Whenever you change the wheels fitted, e.g. light alloy wheels or wheels with winter tyres, you must also use the matching wheel bolts of the correct length and shape of bolt head. Correct fastening of the wheels depends on this.